Hey everyone! This week was spent trying to get back onto schedule after our great vacation to Vegas. Zoe played hostess at one of our playdates and then decided to take an early nap halfway through all of the fun. Zeke is (finally!) neutered and spent the week running into the wall and the backs of my legs with his elizabethan collar. Kirk left early Friday morning to go to the NC Bar Convention in Atlantic Beach, NC, where he was elected Secretary for the Young Lawyers Division, and returned home on Sun at lunchtime. Ollie and I did our usual; Ollie slept, and I did laundry, made Zoe her meals, and ran errands. I know, it’s not incredibly exciting, but hey, this is what we do. 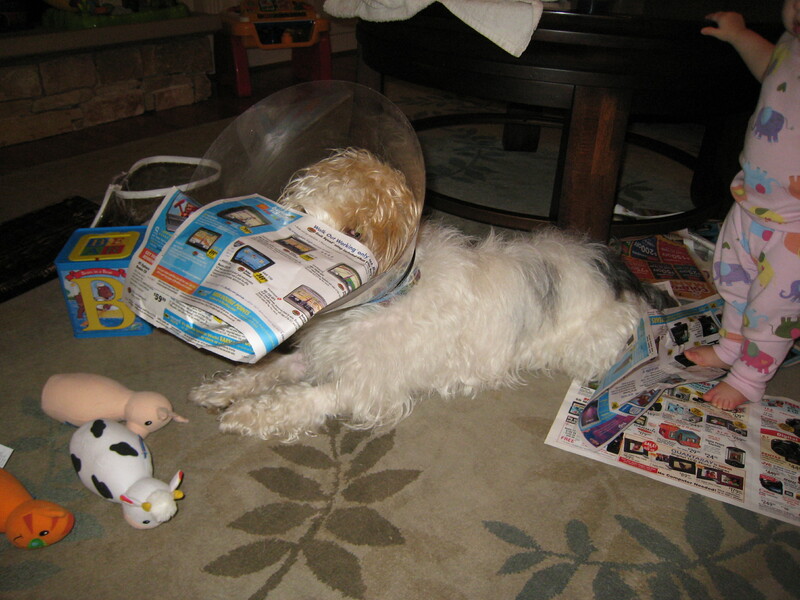 Zeke wearing his elizabethan collar and checking out the Sunday ads. 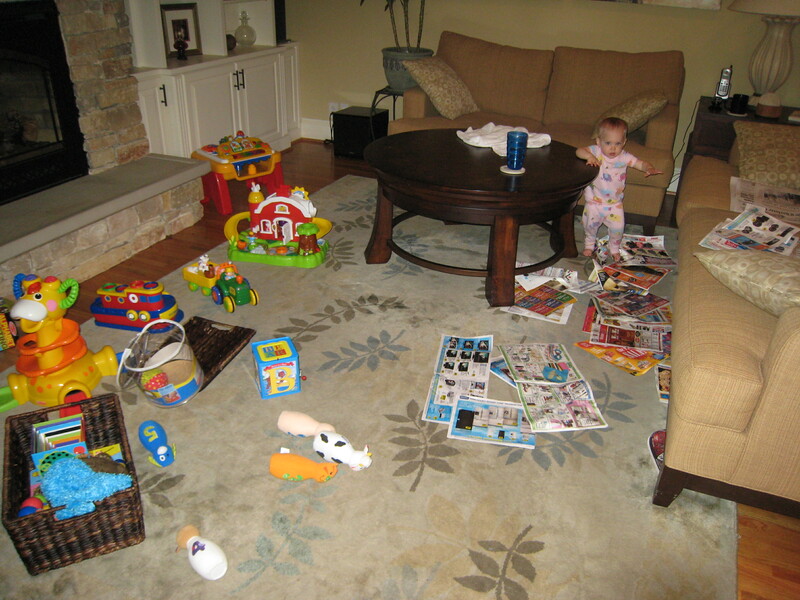 This is what our living room typically looks like on Sunday mornings: Zoe’s toys strewn on the floor along with the Sunday paper, which Zoe “reads”. The only thing missing is Ollie sleeping on the couch, and Kirk and I sitting on the other couch reading the paper. Playgroup on Wed, 6/19 at our house. Zoe’s “twin”, Kate, is Zoe’s oldest “friend”. Her parents and Kirk and I met during our Bradley birthing class. Kate turns one in the middle of July. Zoe, Kate, and Ava splash around in the pool.